Presenting our ABS-Lock III-R-ST anchorage point in moving images: Watch our short product video to find out more about its most important features! 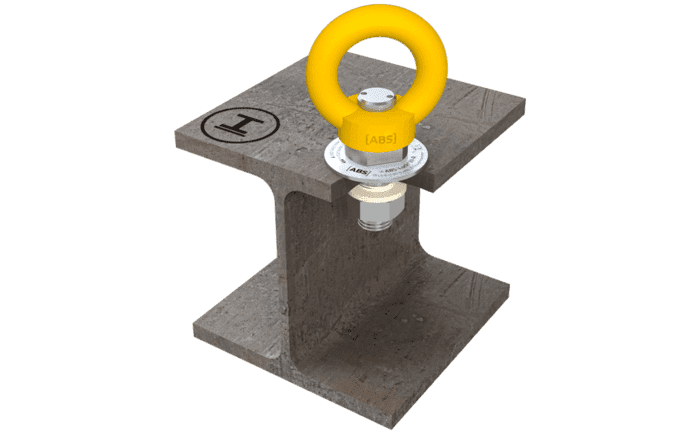 When installed on a steel girder (flange depth 6-26 mm) and accordingly countered, this stainless steel anchor offers workers at heights a freely rotating anchorage eyelet. Simply insert the anchorage point, which is suitable for all directions of load, through a pre-drilled hole and counter using the nut supplied. Not suitable for recurrent abseiling usage when installed overhead! Our ABS-Lock III-R-ST (countered model) is equipped with a 360° rotating ring eyelet - offering you optimum manoeuvrability, particularly in confined working environments, such as wind turbines, large machines, maintenance halls or industrial production facilities. In addition to its mandatory certification in accordance with EN 795, this anchorage device has also been tested for wind turbine usage in line with EN 50308. Our fall protection device is bright yellow (RAL 1003) so you cannot miss it. If you are not planning to implement our ABS-Lock III-R-ST in a wind turbine situation, we can also supply it in other colours - just ask us. Our ABS-Lock III-R-ST (countered model) can be attached to any steel structure with a depth of at least 6 mm. The anchorage device can easily cope with any direction of load and can be used to secure up to 3 individuals working at heights (in the case of a wind turbine: max. 2 individuals in accordance with EN 50308).